The controversial work of video art that the National Portrait Gallery removed from its current exhibition on gender identity reappeared elsewhere on Wednesday: in the front window of the Transformer Gallery near Logan Circle. As an act of defiance, the gallery president, puzzled and angered like many in Washington’s art community, presented “A Fire in My Belly” by David Wojnarowicz to any passersby on P Street NW. James Alefantis, the Transformer president, is showing a continuous loop of the banned four-minute artwork – with a few seconds in which ants crawl across a crucifix – and promised to run it for 24 hours. Late Wednesday, the gallery had secured rights from Tom Rauffenbart, executor of the artist’s estate, to show the entire 30-minute original version of the artwork, which it will begin screening Thursday. “I only wish David were alive, he would tear these censors apart,” Rauffenbart said. Other artists took to the streets, specifically the sidewalk outside the Portrait Gallery. A text message urged people to gather. Adam Griffiths, a 28-year-old artist from Takoma Park, wore handcuffs and held a mirror with the words “PUT IT BACK” written on its face. He was joined by Adrian Parsons, 28, of Washington, who carried a sign that read “National Censorship Gallery.” A group of local artists has scheduled a protest outside the museum for Thursday night. Inside the National Portrait Gallery on Wednesday, Director Martin E. Sullivan was inundated with calls and e-mails as he defended the removal of the video, reiterating that the museum had eliminated a distraction from an important exhibit and that no further changes were planned. His comments were seconded by three members of the Smithsonian Board of Regents: Chair Patricia Q. Stonesifer, Sen. Thad Cochran (R-Miss.) and Sen. Patrick J. Leahy (D-Vt.). Stonesifer offered that she had seen the show three times but had not viewed the video. “This is an important show with excellent scholarship and I hope that other visitors will learn from it as I did,” she wrote in an e-mail. Smithsonian Secretary G. Wayne Clough directly addressed the outcry late Wednesday night in an e-mail to all Smithsonian employees. “Most of the recent attention about the exhibition has focused on 11 seconds of a four-minute video clip, perceived by some to be anti-Christian and intentionally provocative. Neither description could be further from the truth. However, it was clear that this video was detracting from the entirety of the exhibition,” Clough said, adding that he understood the criticism of that decision. The American Association of Museums, based in Washington, said the Portrait Gallery did the right thing in deciding to pull the video in question. “We concur that it should not distract from the other thoughtful and provocative work in this important exhibition. However, we regret the controversy surrounding the excellent show,” said Ford W. Bell, the group’s president, in an e-mail. Instead, Moran argued, the Portrait Gallery buckled under pressure from critics looking to exploit the artwork – only 11 seconds of which was considered objectionable – for personal and political gain. Himself a Catholic, Moran said that Catholic League President William Donohue, who “implicitly condoned all the pedophilia that was going on in the church,” should be using his energies to object to much more serious offenses against humanity. Incoming speaker of the House John A. Boehner (R-Ohio) and incoming majority leader Eric Cantor (R-Va.) yesterday echoed Donohue’s salvo, adding that the exhibit was a misuse of taxpayer dollars. Sister Mary Ann Walsh, the director of media relations for the U.S. Conference of Catholic Bishops, said the bishops had no position on the video in question, nor did she expect any position in the future. The Catholic Church usually does not get involved in local disputes but occasionally the Vatican’s official news outlet, L’Osservatore Romano, weighs in on art matters. It didn’t think much of Paduan artist Maurizio Cattelan’s piece “Nona Ora,” which portrayed Pope John Paul II crushed by a meterorite. 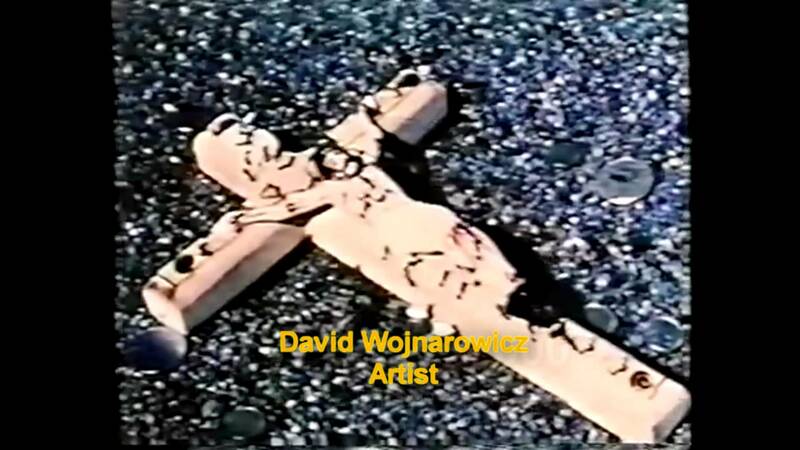 The reaction to and removal of the video stems from a fundamental misunderstanding of the artist’s intent, according to Wendy Olsoff, owner of PÂ·PÂ·OÂ·W Gallery in New York, which represents the estate of David Wojnarowicz. Olsoff says she will issue a press release that points to Wojnarowicz’s writings, which she hopes will provide proper context. Besides planning to show the full 30-minute video starting Thursday, the Transformer Gallery is organizing a campaign to reinstate it in the exhibit. Organizers are drafting a letter to the Smithsonian, meeting Thursday at 5:30 p.m. at the Transformer Gallery, and marching in protest to the National Portrait Gallery, according to Alefantis. The museum staff on Wednesday was re-programming the kiosk that played the Wojnarowicz video. A seven-minute cut from “Pink Narcissus,” about the fantasies of a young male prostitute, directed in 1971 by James Bidgood, will be ready soon. Freelance writer Jessica Dawson and staff writers Dan Zak and Jason Horowitz contributed to this article.